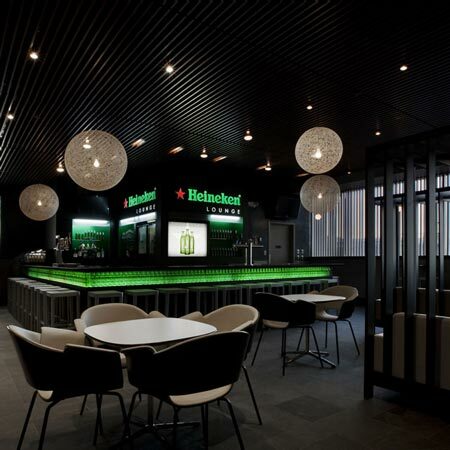 Amsterdam designers UXUS have completed a bar for beer brand Heineken at Newark International Airport, New Jersey, USA. The bar opened last month. The interior uses custom designed leather sofas, Heineken green anodized aluminum tables and atmospheric lighting. Amsterdam, 16 December 2008 – First Heineken Lounge opens at New Jersey’s Newark Liberty International Airport 17 December 2008. Heineken and Delaware North Companies has commissioned UXUS to design the Heineken Lounge. A bold new bar concept designed for International Airports bringing the Heineken brand to life, for travelers the world over. It is an inclusive experience, giving travelers a “third place” to escape the chaos and stress of international airports and offers the benefit of Heineken’s exclusive Extra Cold chilled beer system, a fully stocked cocktail bar, within the relaxing environment you would expect from a premium airline club. The environment is cosmopolitan, designed with the international traveler in mind. It incorporates Dutch design icons with custom designed seating areas created to help relax and refresh travelers in their transit. Special Cabana seating offers a sense of privacy in a public space with the comfort of a luxurious leather sofa. Heineken green anodized aluminum tables, Wengé wood room dividers, and atmospheric lighting all contribute to the sophisticated Heineken Lounge experience. “UXUS is thrilled to have been able to create this international and premium brand experience for Heineken and Delaware North Companies. This project was a great opportunity to fill the void in International airports for an innovative and cultivated lounge experience that is open to the public,” says UXUS Creative Director George Gottl. Founded in Amsterdam in 2003, UXUS is an award winning international multi-disciplinary creative agency specializing in retail design, branding, hospitality and interiors. UXUS delivers innovative and exciting design solutions to its global client base, including Adidas, Levi’s, McDonalds and Nokia. Recent projects for UXUS include the McDonalds McVillage and the prestigious Merus Winery.